Anirban Dasgupta is a comedian, writer for web shows. Uncorroborated reports state that he is the hardest working Bengali in the world, for others were too lazy to contest. Based out of Mumbai, he is actively involved in building an active comedy scene in Kolkata. He was one of the founders of ‘Comedified’, one of the first legit comedy groups of Kolkata. 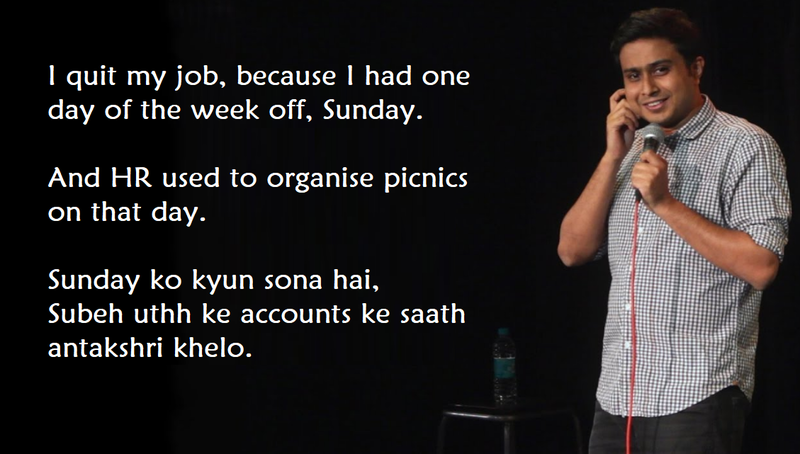 His jokes, puns and sketches are based on the stories from his personal life. He also likes to about his inter-community marriage, corporate life, politics (being Bengali), social media and various current affairs. Anirban has performed extensively across the country, been featured as a ‘Best in Stand up’ act and has opened for the biggest stars, including Vir Das and Cyrus Broacha. Moreover, he has featured in over 400 shows, which include auditorium shows, college fests, corporate and private shows. He has been featured multiple times on NDTV Prime’s The Rising Stars of Comedy and by India Today, The Times of India, Mid-Day and The Telegraph amongst others. Earlier in 2018, Anirban released his Amazon Prime Special called ‘Take It Easy’ jokes about the internet era and his experiences in his hometown, Kolkata. Here are Anirban’s funniest 3! When he mentioned that India’s favourite fictional book – The Constitution of India allows Freedom Of Speech, but with Eight exceptions. Where he highlighted that Sales & Marketing are two different things. In sales you are going out and selling stuff. While, in marketing you are indoors watching Youtube videos. When he shared that his mom wants another shot at raising a kid.